Service boats: 6, two jet-skis, three tenders for coastal navigation and one SOLAS-compliant Novurania lifeboat. For further information and details contact: Lürrsen Yachts; Zum Alten Speicher 11; 28759 Bremen; Germany; tel. 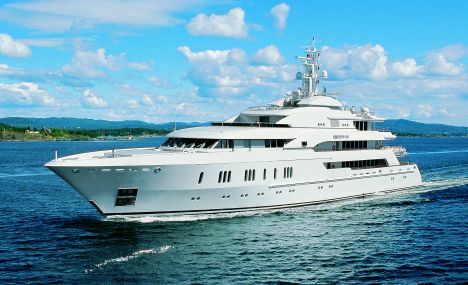 +49 421 6604166; fax +49 421 6604170; website www.Lürssen.com; e mail yachts@Lürssen.com. "The show must go on", a queen of rock sang. We may read this sentence in several ways and give it infinite interpretations. If we refer to the subject that interests us the most in this article, we could say that the show is made up of a succession of ships deserving one of the infinite thrones offered by the sea. Why are they infinite? Because a real Queen is the one who at the eyes of those who admire her is considered as such and, therefore, by paraphrasing Pirandello, we could say that there are as many Queens of the sea as there are seamen who believe to admire one of them. The German shipyard Lürssen is not new to the construction of yachts worthy of carrying with pride on one side of the hull the name "Queen" and "Queen M", launched on June 12, 2004 and readily used for cruising in the North Sea, is one of the last units built. 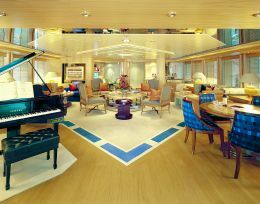 She was designed by Espen Oeino and interiors were developed by Donald Starkey. The yacht was designed for long crossings and for this reason its range is of approximately 5,000 miles at a constant speed of 12 knots. She is fitted with several devices that make her totally independent for months on end, during which no stops in harbors for supplying or for other needs are necessary. A ship having such characteristics is obviously studied in details from her overall structure to each single plant in order to guarantee adequate safety standards. Since 1875, Lürssen has been creating units whose main characteristics have been reliability and performance. It is not by chance that the yard's history is crowned by important records that inscribed the name Lürssen in shipping history. Just to go through some glorious moments of the German yard, we shall remember the first ship in history fitted with a diesel engine, built by the same yard in 1886, the first remote controlled boat and the first minesweeper built for the German Navy. Since then, Lürssen built several military and commercial ships for several applications, such as cargo and passenger transportation, in brief, it has a vast experience marked by a high design and construction quality. But let us go back to our Queen. The yacht's six decks were designed with the intention of creating a modern and streamlined style, most especially of the superstructure. The interior layout is marked by a more classical approach and materials and colors were chosen by the Owner. On the main deck, there are six guest cabins with sea view through ample windows that were cut out in the structure and which give a lighter look. 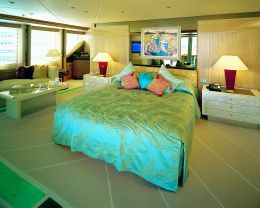 All cabins cover each a 30 sqm surface and are decorated with the same identical style except for marble type and color. 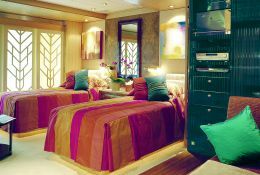 Moreover, each stateroom is fitted with a bathroom and separate bathtub or shower stall. 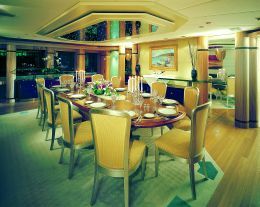 The guest cabins are lined along the same corridor which is connected to the other "Queen M" decks by an elevator which takes directly to the main salon and dining room. The salon includes an ample bar with piano and a suitably equipped cinema. 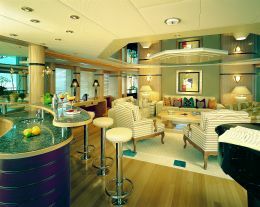 The upper deck includes an additional private salon with separate office, gaming table, piano and bar. Aft of the superstructure, a large door offers access to an open-air space ideal for informal lunches with a table for 16 guests, bar and sofas. Very large transparent structures protect this area from the wind and make it a very enjoyable space in all weather conditions. A ladder connects this deck with the Owner deck which covers a total surface of 90 sqm and includes the Owner suite with a double-bed and a changing room hidden by a flush door lined with the same material used for the other surfaces. The Owner deck has a privileged view, offered not only by its raised position but also by the fact that it may be appreciated out in the open as well as in closed quarters. 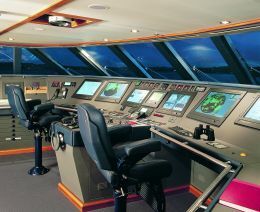 The modern high- tech navigating bridge occupies the upper deck forward. Thanks to the newest instruments even the remotest plant on board may be controlled. 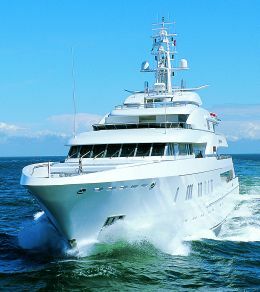 "Queen M" meets the requirements set by MCA rules, thus she was built with complex structures capable of offering high safety standards and as appropriate or a yacht of this size. 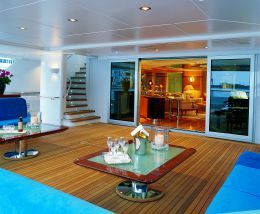 Inside one of "Queen M"'s garage there is a 7.5-m Nimbus motor yacht as well as an 8.5-m water-taxi purposely designed for "Queen M". In both cases, launching and hauling are carried out through openings created in the hull sides aft, by means of guides on the ceiling of the garages for simple and hasty operations. 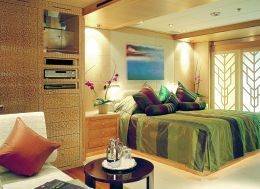 No tenders were fitted on deck in order to offer ample relaxation areas similar to those of a big hotel on the sea. The lifeboat is fitted aft and it is accessible by way of an hydraulically-operated port, which may be easily, safely and quickly operated. In order to offer our readers an idea of the safety systems existing on board we point out to the 360 sensors distributed all over the yacht thanks to which the control system is capable of constantly monitoring the state of all on-board plants.